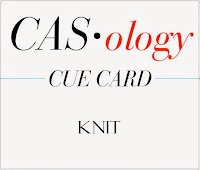 So, this week I was asked to guest design over at CAS-ology. :-). They have such fun challenges and an amazing design team. This weeks cue word is "KNIT". So many possibilities with this word. I had a few ideas and was playing around but wasn't coming up with anything that I loved. Then while sitting and watching TV inspiration struck! Unfortunately, it took some effort to get my idea to work. It just didn't look right. I had to step back, take a break and come back to it. Then it just seemed to fall into place. :-). Anyway, enough talking about it, let me show you! 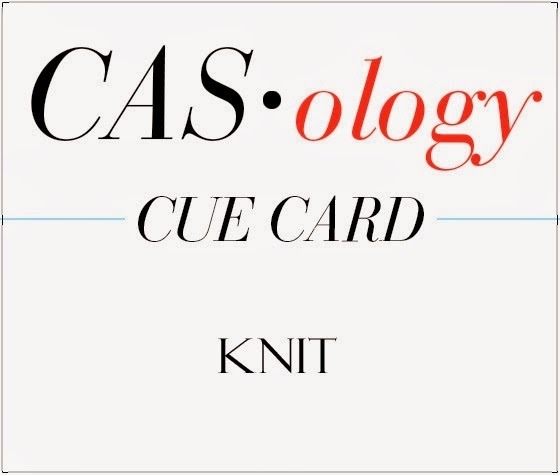 My first thought when I was told the cue word was what kinds of things are knitted? Socks, mittens, sweaters...... Then it came to me, eurecka! Scarves! I could make a small scarf! Then it was, how the heck am I going to do that??! I thought about all the Christmas crafts I had been making for my craft fairs and figured I could do something similar. I took an argyle sock (my Mom sent them to me for my crafts. Don't worry, they've never been worn. LOL) and cut a strip out of it cutting the ends to make a fringe. I tied it like a scarf would be and glued it to my white panel. It's looks kind of black in the photo but the main colour of the scarf is a dark purple. I stamped my sentiment (Technique Tuesday, Flurries set) in timber brown StazOn. Then popped my panel up with foam dots on my white card base which I think helps create visual interest without being overwhelming. Well, thanks for stopping by for a visit and I wish you all a very Merry Christmas and Happy New Year! Kim, that little argyle scarf is the cutest and to think you made it by repurposing socks! Genius! Eeeek! Amazing! This is just perfect for this week's cue card! Pure genius! You just nailed this! Love your sock-scarf - very creative! Great to have you as GD this week! How very cute Kim!! 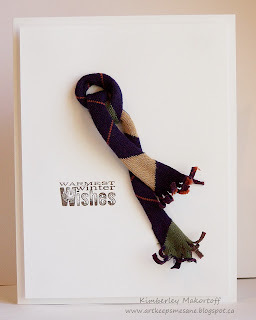 love your scarf - and it fell just perfectly - Congrats on being the GD! Very cute and creative card, Kim!!! Kim, this is So FABULOUS!!! So very OVERJOYED to have you join us as a Guest Designer!! Always love seeing your Fun cards!! Have a very Happy Holiday Season Kim! I'm sorry it has taken me days to get over here. I saw this amazing creation on the CASology blog and was blown away, Kim! Excellent and genius card! Congratulations on the GD spot, too!! Thanks for leaving me your comments. I really appreciate them! Now you can use my personal discount code to save 20% off all stamps, dies and stencils. Can be used on regular priced and sale items. Cannot be combined with other coupons. Just enter in STAMPGIRLKIM to get your savings today. Happy shopping! I'm a SAHM just trying to stay sane by any means possible. I will pretty much try anything crafty. I have a B.A. In Fine Arts and specialized in painting. I have tried my hand at many types of arts and crafts like, stained glass, lithography, scrapbooking, rubber stamping, cake decorating, and much more. There are a lot of things I still want to try. I would have to say that my two favourites are card making and painting. All content (unless otherwise indicated) including text, photographs and design work belong to me. These designs are shared for personal inspiration use only. Designs may not be copied for the purpose of publication, design team work, contest submissions or to gain profit.